With the wide variety of events and activities here at Blackbeards, our Pirates have to have a chart to navigate them along the vacation course. Along with the crazy and exciting activities listed in our event calendars, there are always surprises and spontaneous festivities and happenings all the time! Check out our weekends and choose a “Bikini Contest Weekend” or a “Miss Universe Contest Weekend”. Don't forget to review our daily poolside events, Big Screen Football and much, much more!!! We have so many events and activities; we thought you might like a menu that describes everything we do. Every other Saturday, at 4pm Dominican Time, we kick off our famous Bikini Contest. With over 300 Contests under our belt and counting, all the ship mates and pirates look forward to a great day around our beautiful pool. Sixteen lovely chicas compete for prizes and recognition in a very competitive, fun and exciting atmosphere. Three of our guests are chosen or volunteer to judge the contest. Each contestant, wearing a bikini, dances her away around the pool and bar area to music she has selected. Dancing on the tables, jumping in the pool or pouring ice cold beer all over their body - We never know what the girls are going to do! We award first, second and third place prizes - but . . . Everyone is a winner! Sign-up for our Newsletter to view Bikini Contest photos. On the Saturdays we do not have a Bikini Contest, we head upstairs at night to the Crows Nest Bar for our "Miss Universe Contest - Blackbeard's Style". Six of our beautiful ladies vie for the overall title of "Blackbeards Miss Universe". Hot competition in two categories (Evening Wear and Baby Doll Lingerie), our beautiful girls will do anything it takes to win the crown. Pole ballet, dancing on the bar and other spur of the moment antics, always makes this contest a favorite of our Pirates! Everyone gets to vote for our winner! Afterwards, the festivities continue into the night and all the Shipmates and Pirates get busy on the dance floor! Sign-up for our Newsletter to view Miss Universe Contest photos. What better place to spend your evening? 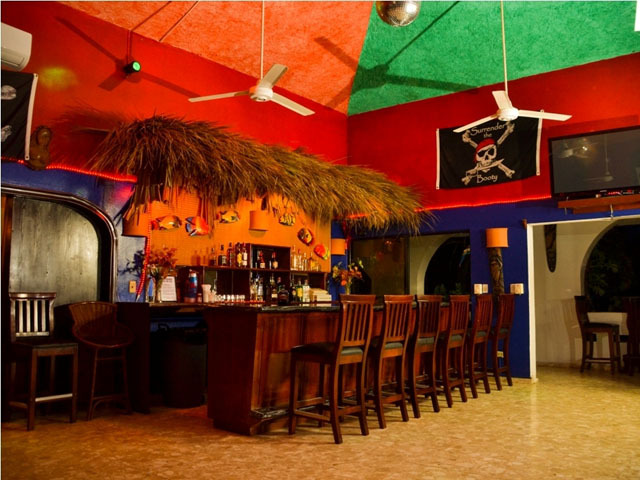 Every Thursday night our Crows Nest Bar hosts our "Show Us Your Colors and Special Dance Show". Our luscious ladies arrive all dressed in the same colored outfits. With great music, special dance shows by the girls, disco lights, mirrors, dance pole and great libations. Our pirate’s comments? . . . AAAARRRRGGGGHHHH!! Sign-up for our Newsletter to view Show Us Your Colors and Special Dance Show photos. We may not have a Bourbon Street, but we do have a Rum Avenue!! On our Miss Universe Contest weekends, bring a costume, mask or make-up! The Crows Nest Bar gets rocking with "Mardi Gras Costume Night and Show". Buckle-up Pirates!! Friday nights our crazy shipmates go ALL out!! 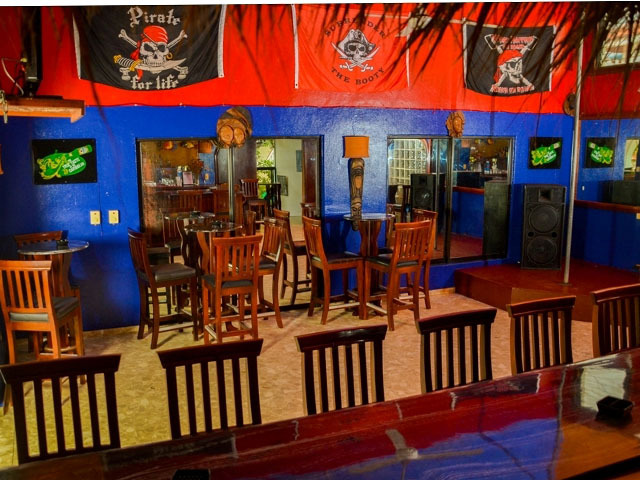 Everyone dresses up in their favorite costume or fantasy garb and the Crows Nest Bar is the perfect place to get close to a gypsy, pirate, schoolgirl, or your fantasy character. Our ship mates love to "Make up . . . Make Out . . . and Make You Happy". Join in the fun and bring a mask or costume during your next trip aboard. What better way is there, to spend a Wednesday, than with a few Shipmates in sheer, wet t-shirts. The slight chill in the air makes the water seem like icing being applied to a dozen different shaped donuts. Ah, the Shipmates revel in their opportunity, to show a side of themselves to our Pirates that are not normally visible. Strangely enough, our Pirates seem to enjoy themselves as well. Sign-up for our Newsletter to view Wet –T- Shirt Contest photos. On Bikini Contest weekends, you have to join us on Friday nights for our "Baby Doll Show and Raffle". 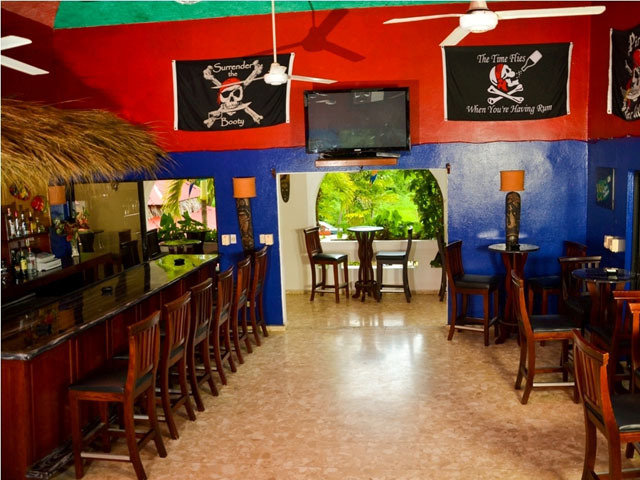 Grab a few pesos, a cold beer and find a great seat in the Crows Nest Bar. Several of our scantily clad beauties will put on a dance show that will leave you . . . breathless! Buy a ticket and win prizes. Grand Prize is a private dance and you get to keep the Baby Doll. Does it get any better? Sign-up for our Newsletter to view Baby Doll Show and Raffle photos. After you cool down from our Bikini Contest, get ready for a great night! Head upstairs for "Saturday Night Fever" with all of our beautiful shipmates. Enjoy a great mix of music, disco lights and great libations. Bring your own favorite music and dance the night away!! White men can't jump and gringos can't dance? 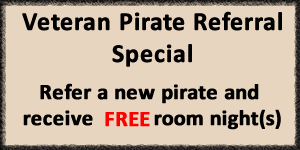 Well, our pirates can dance, and show their athletic prowess on Sun-Mon-Tue Nights - because we have everything from Game Night, Pajama Party, Hot Shorts Night!! Our Drunken Parrot Bar hosts these crazy festivities and you never know what the Shipmates will come up with next!! During the day, why not join us for some serious play time in our beautiful lagoon. 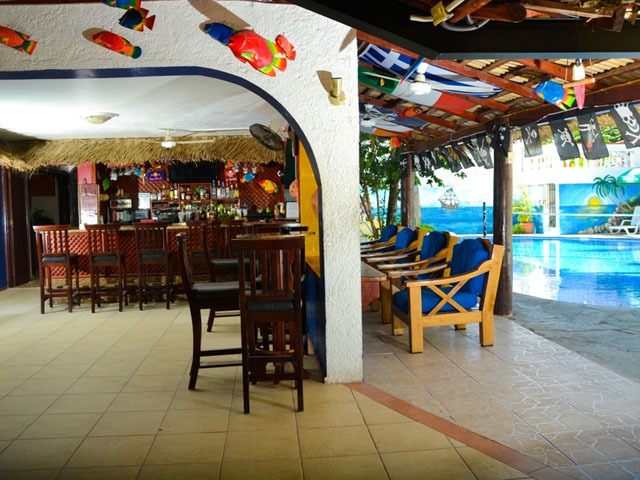 Every afternoon we have a variety of wet and wild events in the pool and around the Drunken Parrot Bar. Volleyball, contests, water races and who knows what else. Crank up the music, grab a cold beer and have fun! A little Margaritaville in Pirate heaven! Are you ready for some football??? Any time there is a game you want to enjoy, we have two brand new HD flat screen televisions in our Drunken Parrot Bar and Restaurant. Popcorn is free and the beer is always ice cold! You wanna make a bet, pirate?? Our Super Bowl Weekend Party kicks off on Thursday Night with Show Us Your Colors and Special Dance Show, followed Friday Night with Baby Doll Show and Raffle and our famous Bikini Contest on Saturday. Super Bowl Sunday consists of a Special BBQ Menu, Football Pools, Shipmate Cheerleaders, Free Popcorn, RD$75 Mamajuana Shots, Halftime Show and Much More…..
Start your Sunday off with a great breakfast and then head to the beach for a relaxing swim. Catch some rays, read a book, think about anything that makes you happy. Hey - You earned it - Right? How about a little Jacuzzi action at night? Tropical waterfalls, bubbles and massage jets - and just ring the bell for bar service!! AAARRGGGHHHH! Now you can keep track of all the action with our monthly Event Calendars, provided below so you can plan, pack and PARTY! !